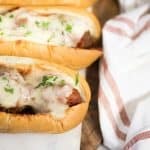 Crock Pot Meatball Sandwiches are classic tailgating food! They're an easy dinner recipe that tastes amazing! If you can make a hamburger you can make Crock Pot Meatball Sandwiches!